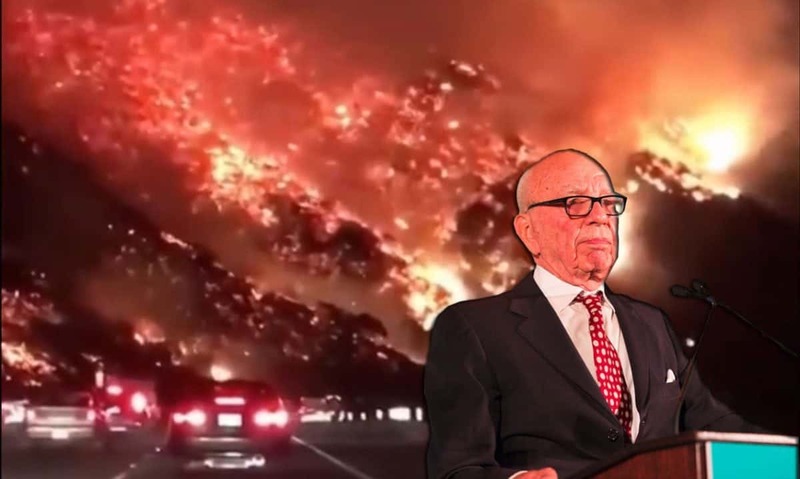 Wildfires in California have burned across Sky News owner Rupert Murdoch’s $30 million winery. Murdoch, who owns Fox News Channel in America along with News International properties The Times and The Sun in the UK, has had his winery scorched as the blaze rips through Bel-Air. Many on social media have said it is comeuppance for his climate skepticism while others have pointed to his controversial publishing record. The media mogul has endured a shaky year already with News Corp recording a loss of £629 million in the full 2017 financial year due to a fall in the value of its print media. So this is the latest setback in a bad year for the media mogul. Firefighters and helicopters were unable to stop the flames that have ravaged parts of California scorching Murdoch’s estate, including buildings in the upper vineyard area on the 2.8 hectare property he bought for $28.8m in 2013. 200,000 people have fled the Southern Californian fires that have torched 158,000 acres and are still blazing out of control. With strong winds forecasted, the fires may worsen.